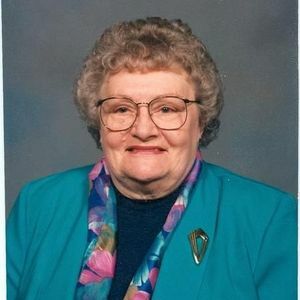 Lucille M. Kruchek, 88, Wahpeton, ND, passed away Thursday, May 30, 2013 at St. Francis Healthcare Campus, Breckenridge, MN. The Funeral Service will be Saturday, June 1, 11 a.m., at Willow Creek Chapel, Wahpeton, with Rev. Jule' Ballinger officiating. Visitation will be one hour before the service on Saturday. Interment will be at Elk Creek Cemetery, rural Wyndmere, ND, at a later date. Vertin-Munson Funeral Home, Wahpeton is in charge of the arrangements. Lucille "Lu" was born January 2, 1925 at Danton Township, near Wyndmere, ND, the daughter of Theodore and Ella (Rohl) Krause. She attended rural school and lived on the farm. She spent four years working in Seattle, WA where she lived with her sisters. She returned to the Wyndmere area and married Allen Kruchek, on March 7, 1948. The couple lived in Minneapolis, MN before returning to the Wyndmere area. Lu moved to Wahpeton with her children in the early 60's where she worked as a waitress at the Del Rio and Clem's' Café. She worked for ten years at NDSCS Food Service. She entered the Leach Home in Wahpeton in 2010. Lu was a member of Bethel Lutheran Church, and had helped with Sunday School and Girl Scouts. She kept active crocheting, making afghans and many pot holders for family and friends. Her children and grandchildren especially cherished the dolls she made for them. She enjoyed fishing, nature and taking trips with her family. Lucille is survived by her six children, Rachelle (Russ) Smith, Bemidji, MN; Sheila (Ron) Paulson, Little Rock, AR; Patti (Leland) Gregor, Wahpeton; Melinda (Don) Wiedell, Duluth, MN; David Kruchek, Little Rock, AR; and Darin Kruchek, Brainerd, MN; ten grandchildren, fifteen great-grandchildren, one great great-grandchild, two brothers, Vern (Jean) Krause, Wahpeton; Leyone (Marleen) Krause, Lidgerwood, ND; two sisters, Carole Jean Bohlken, Fargo, ND; and LaVelle (Elroy) Odegard, Gwinner, ND. She was preceded in death by her parents, four brothers, Alfred, Willard, Kenneth and Donald Krause; two sisters, Loretta Dable and Dorothy Peterson.